Lorna Prince skydives to raise funds for the GSPCA, how could you help? Could your business, office or school house a GSPCA Counter Box or Collection Box? We are at many events around Guernsey to help raise funds for the GSPCA. The Build Partner programme is designed to meet the building costs associated with our new £900,000 Wildlife Hospital. The building is to replace a variety of existing structures that have become unusable with age. Our new building incorporates a hedgehog rooms, seal facilities, rehabilitaion pools, aviaries, a raptor room, baby bird rooms, isolation facilities, a secure transfer location, storeage, kitchen, utilities and organisational spaces and facilities for the day to day running of the GSPCA. and follow their portal to the retailer you require. A percentage of your purchase amount is paid to the GSPCA – this percentage is paid by the retailer not you. There a few other Guernsey charities already doing this so let’s try and raise lots of funds. 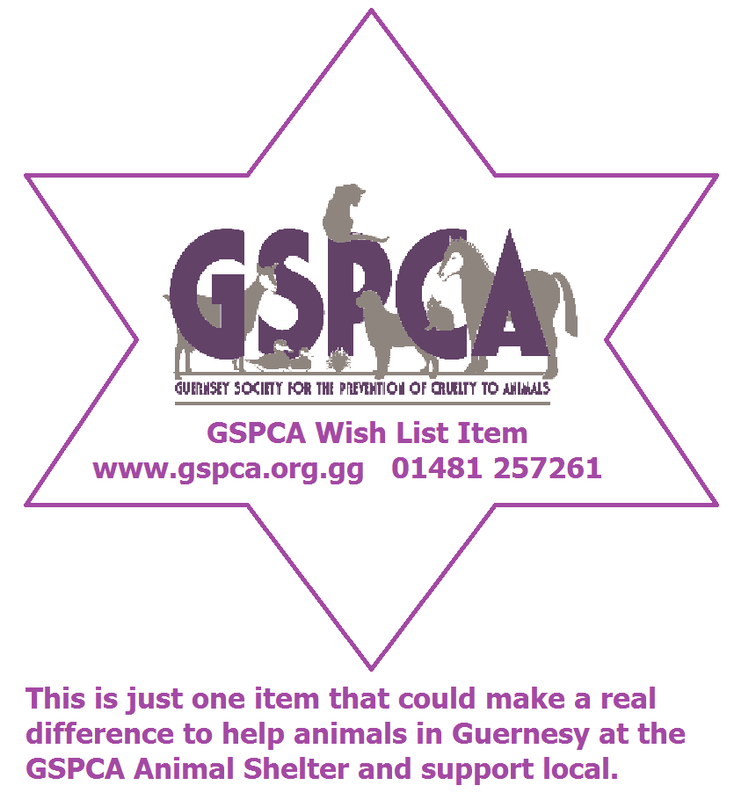 We are appealing for local business that wish to support the GSPCA to consider displaying a GSPCA Wish List Star on items that would benefit the animals in our care and to have a collection bin for those items. To see the GSPCA Wish List please click here and the Amazon Wish List please click here. By checking out our Wish List items you can see many of the items we use regularly and some which we have a special need for. From dog sledding to treking in Nepal, check out this link to find out exciting ways to raise funds for the GSPCA. Click here for more details. At the GSPCA we always need your help. There are many ways that you can support us and this is yet another. We have signed up to a website that you can buy a dog bed online for the Animal Shelter. You may ask why? The Kuranda dog beds are soft warm comfort, guaranteed chew proof, replaceable fabrics and parts. Also they are easy to clean and last for years making them ideal for the kennel environment. We are also appealing for donations towards purchasing extra heat pads for the many sick and injured animals that come into our care. Each of these help save lives. We are very grateful so far as every £30 means we can replace many of the pads that we have had for many years but we still need more. You can donate online www.gspca.org.gg/fundraising by phoning the Shelter or by calling in when you are passing. As the GSPCA is an animal welfare charity we receive no States support. Therefore we are entirely dependent on members of the public to help with donations and fundraising to help us look after the large numbers of unwanted, abused or elderly pets and injured wildlife every year. At the GSPCA we are continually looking for new and innovative ways in which to fundraise so that we can look after the animals that come into our care. We have regular events and they will be advertised here and in other media - below are just a few fun ideas - don't forget to look on our events pages as well. We are so very grateful to everyone who helps us in whatever way they can. Barbecue - Hold a barbecue this Summer and charge friends and neighbours to come along to your party. Car Boot Sale - Raise money and have a clear out all at the same time, get rid of all of your unwanted clothes, cds etc. Dinner Dance - Have a band/live entertainment, good food, organise a raffle and/or an auction. Dress Down Day - Ideal if you work in an office where your colleagues might love the chance to work in jeans. Car wash - Ask your neighbours if you can wash their car. Charge for the service, and you never know, you might also get a tip! Karaoke Evening - Ask a local venue to host a Karaoke night for you and charge people to take part. Tombola - Get some raffle tickets and persuade your friends and colleagues to donate prizes. Charge for tickets and all money raised can be donated to the GSPCA. Disco - Organise a disco or 70's night - with fancy dress! Everyone likes an opportunity to dress up so most fancy dress themes are sure to be embraced! Aerobics - If you enjoy keeping fit - or want to start - why not get people to sponsor you over a certain time? No Drinking - Revitalise your body and give up the bottle for a few weeks - ask people to sponsor you. Open Day - If you have a colourful garden, let fellow garden lovers come and admire, for an entry fee. Cake sale - Sell homemade biscuits, cakes and sweets at markets, shopping fairs or even in your office. You can even sell items as part of another fundraising event, such as a coffee morning or work party. Car Treasure Hunt - A challenge event for friends, and a fun way to raise big money. The event can also be arranged as an on foot treasure hunt if you want to reduce the carbon footprint for your event. Dinner party - You can hold a dinner party anywhere: invite a few friends to your home, or rent out a hall and make it a community event. Combine your dinner party with other fundraising activities like a raffle or silent auction for even more fundraising success. Match the pet to the owner competition - A fun one for the workplace! Ask your colleagues to bring in one photo of themselves and one of their pet. Charge people £1 a time to match up all the photographs. Sponsored Bike, Run Or Swim - Alone or with a group of friends, you can raise money by collecting donations for a sponsored run, bike ride or swim. Donors can give a flat donation, or they can pledge a certain amount based on the distance you cover. Sponsored Dog Walk - This can take many forms, from a “walk-a-thon” style – where participants earn donations for the distance they can travel – to a large-scale dog walking event. The latter is like the many sponsored runs and walks you see advertised, but with a doggy twist! A great fundraiser and fun and exercise for the dogs too! Do you know about Tax relief on donations to Guernsey Registered Charities? To find out more please click here. Thank you for caring and your support, together we can make a difference.